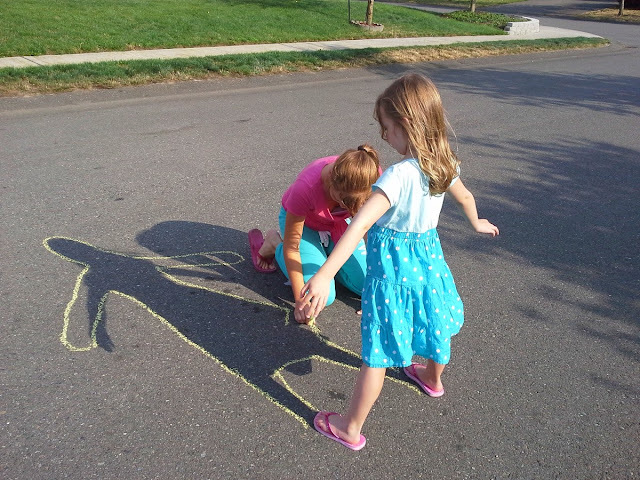 Clever, Crafty, Cookin' Mama: How Does Your Shadow Grow? Just a quick post, as we are making the most of a gorgeous sunny day here in Washington. We did a little science experiment with our shadows. The girls love playing with sidewalk chalk. 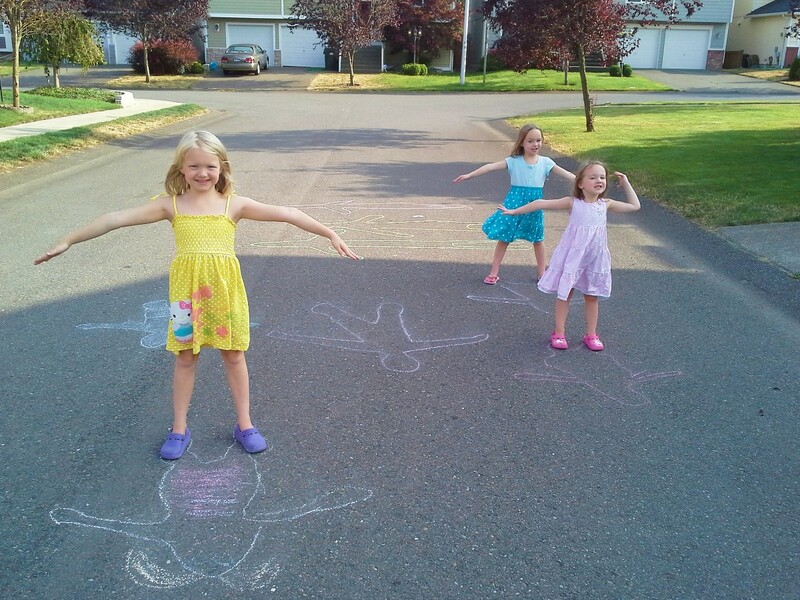 Many a rainbow, flower, stick figure and hopscotch game have lovingly been scrolled on our driveway. My hubby even gets into the act sometimes and will write strange little sayings that I'm sure totally confuse the heck out of our neighbors. I bet one of them might even have a blog reporting on his zany antics. If they don't, they should. Last week he wrote "No Squatch Zone" (as is Sasquatch). Another time he wrote "No Plane Landing Zone", which my 6 year old wrote underneath "Yes Planes Land Here". I just shake my head and pray they are not reading too closely. Anyway, back to the shadows! 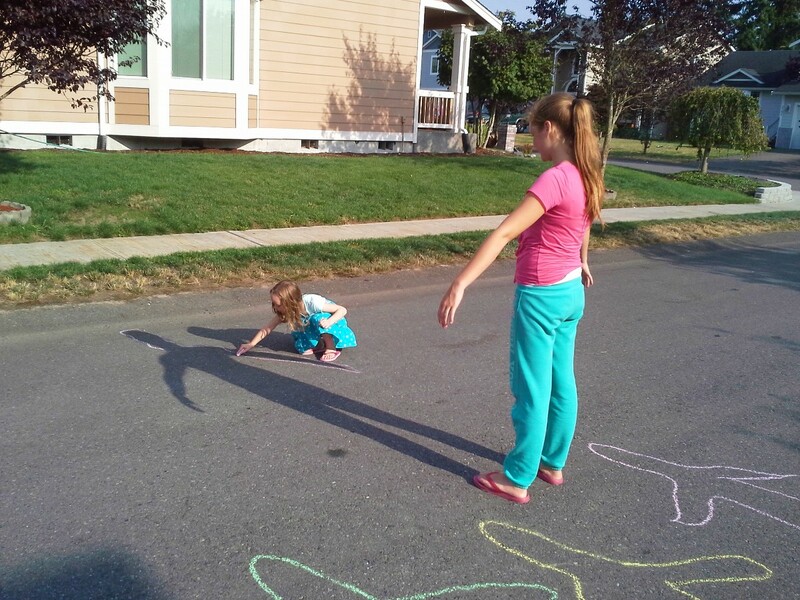 My girls had the sidewalk chalk out in full force and we decided to trace their shadows. We love our dumpy little shadows. They were shorter than our real selves. 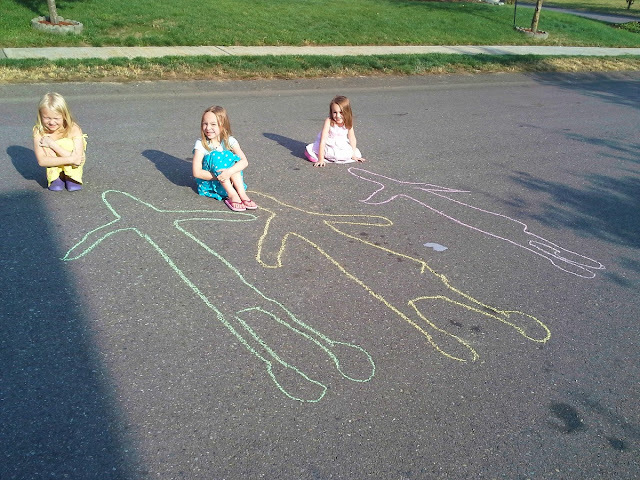 We did this at lunch time and their shadows were a bit on the short and squat side. (I didn't take many pics at high noon due to squinty eyes, so we waited until they were in the shade) Our neighbor came out later and said he thought these were "airplanes with heads" lol. My youngest modeling her pink airplane, with head. Then we had a great idea. 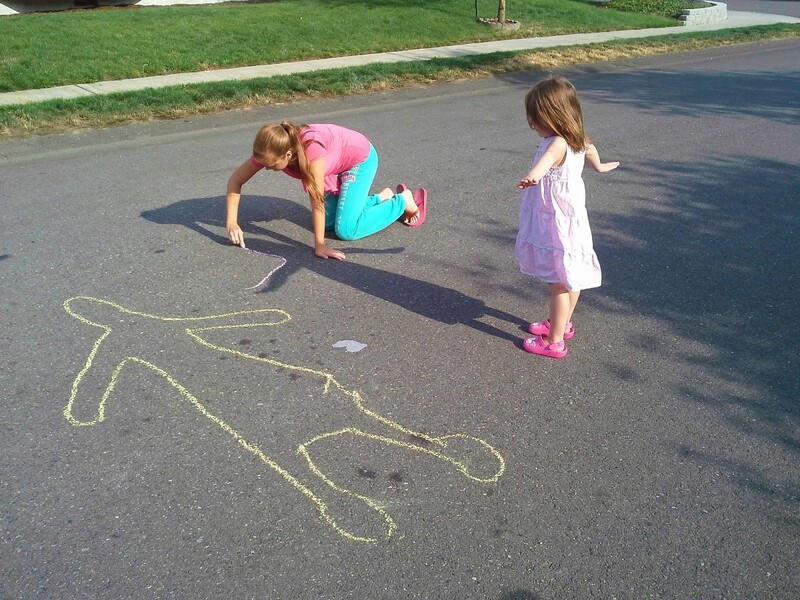 What if we came back later in the day, how would our shadows change? Well around dinner time our shadows were now long and lean! Very long and lean. 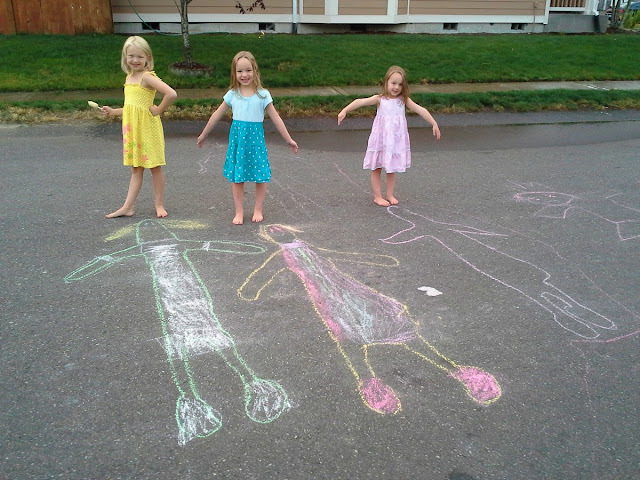 (A big thanks to our neighbor girl Elisa for assisting in the tracing action) She noticed before she could draw them while sitting in one place. 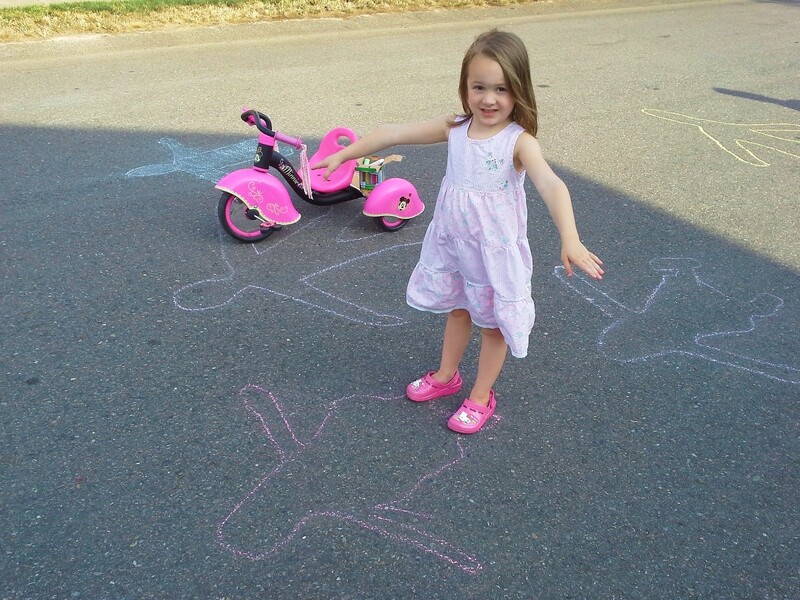 Now she had to scoot along the ground to finish. Not only were they long and lean, but they were turned 90º. How sciency! Even our heads were tall and skinny. They thought that was hilarious. Elisa was the tallest of all. She went all the way across the road. Here is little us sitting next to really tall us. 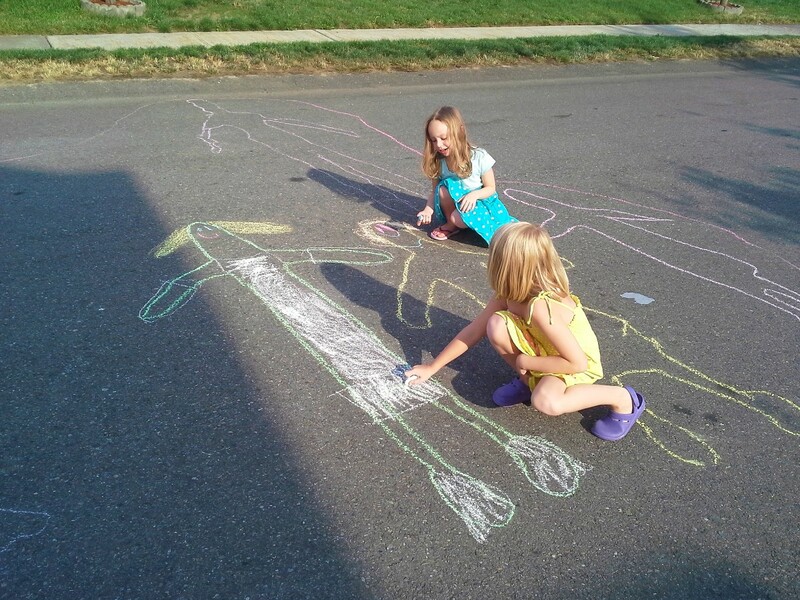 They also got a big kick out of the occasional car that passed by. "They just ran over my face!" says my littlest. And, be it noted: If you have a giant 6 foot shadow of yourself on the ground, you are obligated to decorate it. Our finished really really tall selves.